I would guess that is as good an old wife’s tale as any that instructs one should try hot chicken broth for colds amongst many other similar spicy remedies. We use the scotch bonnet (ata rodo in Yoruba) a lot in West African cuisine as well as the cayenne pepper (tatashe in Yoruba), but I will not be mistaken to notice that back when I lived in Nigeria we used a lot more scotch bonnets for our stews than we will attempt to use here in Europe. The ones grown or imported are somewhat spicier. 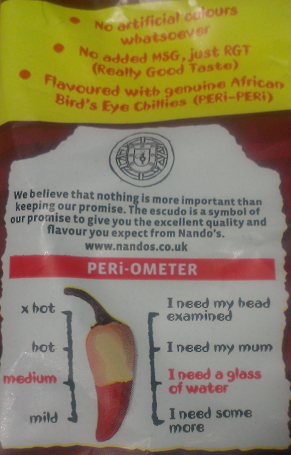 However, this little write-up is caught up in the picture above, which came from a packet of Nando’s crisps. I could not help but notice the Peri-ometer scale, which in a way indicates the spiciness of their products. Whilst I am not a fast food fan, I have been a patron of Nando’s from when they opened their first outlet at London’s Earl’s Court probably in the late 1990’s, if I remember correctly and now, my choice of easy cooking without the class of an a la carte restaurant is between the preferable Vapiano and Nando’s. On the Peri-ometer scale and there are many representations of it, I do like this one because I do remember when I visited my friends’ aunt in Kaduna at the age of 9, she cooked for us, dark yam flour pudding (amala) with stew. Eating with hands, I dipped into the pudding and took bite-sized bit that I first touched to the stew and then to my mouth, when all hell broke loose. It was a case of “I need my mum.” Not only was my tongue and mouth on fire, I was close to spontaneous combustion as the hotness of the chilli in the stew. I cried, I drank lots of water and then settled for a bowl of cornflakes as my friends lapped up the stew as if they could use it for eye salve. They belonged off the Peri-ometer scale. Which is no surprise, because I guess I am crazy and to write a blog about a crisp packet, I probably do need my head examined too.